The barometer, was invented three hundred years ago and work in connection with this invention is very interesting. It seems that Galileo Galilei, an Italian philosopher and mathematician (born 1564 —died 1642), was asked toward the end of his life to explain why water could not be raised in a suction pump more than 32 feet. He was led to believe that nature’s abhorrence of a vacuum did not exceed the pressure of a column of water 32 feet high, but subsequently he devised an experiment to ascertain the power of a vacuum. His apparatus, which was placed in an inverted position, consisted of a tube with a very smooth interior, into which a piston was closely fitted. Weights were applied to this piston to see how much pull was necessary to draw the piston down. Previous to his death he recommended to his pupil (Evangelista Torricelli) that these experiments be continued. His decisive experiment was in ascertaining the length of a column of mercury sustained by the same cause, whatever it might be, which supported the column of water. As the weight of mercury is about fourteen times greater than that of water, he reasoned that the heights of the two should be proportional to their weights. To prove his ideas on the subject, he took a glass tube about three feet in length, closed it at one end, and filled it with mercury. Putting his finger on the open end he inverted this tube in a small bowl, also containing mercury, and when he removed his ringer, found that the mercury sank down in the tube until its level in the tube was about 29 inches distant from the level of the mercury in the bowl. Torricelli continued his experiments and found the level of the mercury in the tube fluctuated as changes in the weather took place. As early as 1645 he published his observations on this phenomenon. He died at Florence, Italy, October 25, 1647, before his great discovery was fully completed. At this time a French author, Blaise Pascal, became interested in Torrecelli’s discovery. His father had sent him to Paris for the study of languages, but the boy’s mind ran along mathematical lines and by the time he reached the age of 12 he was reputed to be as far as the 32nd proposition of Euclid. His father on discovering this, decided to give him a mathematical education. He soon became associated with the scientific societies and astounded the most learned by his knowledge of mathematical problems. At the age of 16 he had invented a calculating machine, although it was never put to practical use. He also had completed the first wheel-barrow chair, a type of dray, and the hydraulic press. When 25 he started his barometric experiments and confirmed the discoveries of Galileo, Torricelli, and others, regarding the weight of the air and its elasticity. 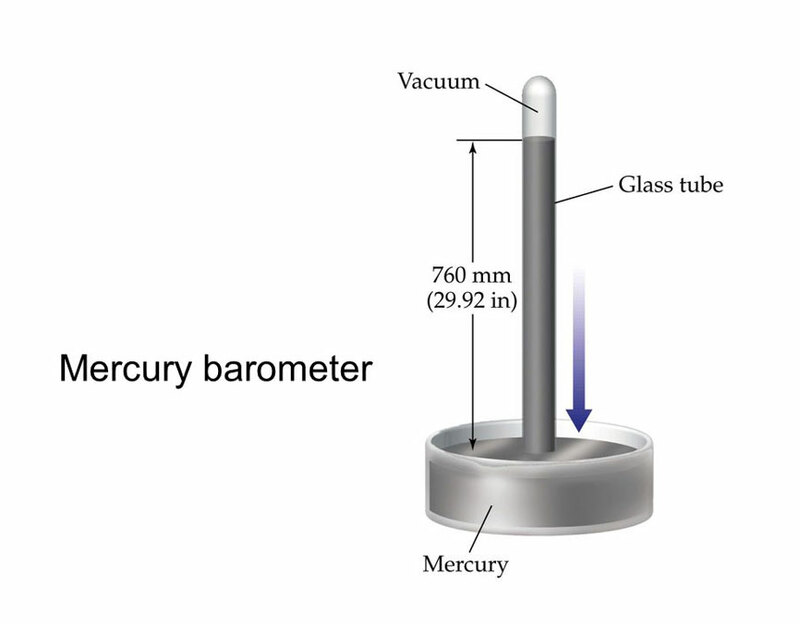 It occurred to him that if the atmospheric pressure supported the mercury in the tube, as shown in Torricelli’s experiment, the height of the column of mercury in the tube should increase or decrease if the pressure increased or decreased. He took up his ideas with Perier, his brother-in-law, who lived near the high conical mountain of Puy-de-Dome, and requested that he should test his theory upon this mountain. This was not accomplished until the autumn of 1648. Perier manufactured two tubes, filled them with mercury and observed them, leaving one in his garden at Clermont, the height of the mercury in the tubes being 26 French inches and 3 % lines. Leaving one behind to be observed during his absence, he took the other up the Puy-de-Dome and at the summit observed that the mercury had fallen in the tube to 23 inches and 2 lines. Noting the tube as he returned he found at the lower levels of the mountain the mercury continued to rise until by the time he arrived in his garden at Clermont the mercury stood at its original level of 26 inches and 3% lines. This was the first time observations had been made of air pressure in regard to elevations. Pleased at his success and confident that the ideas of Pascal had been proven correct, he repeated the experiment, going to the highest tower in Clermont. He communicated the results of his experiments to Blaise Pascal, who himself made similar observations, both from a high house and a belfry in Paris. Satisfied beyond measure with the results, he proposed this process as a means for determining the heights of any one place above another. 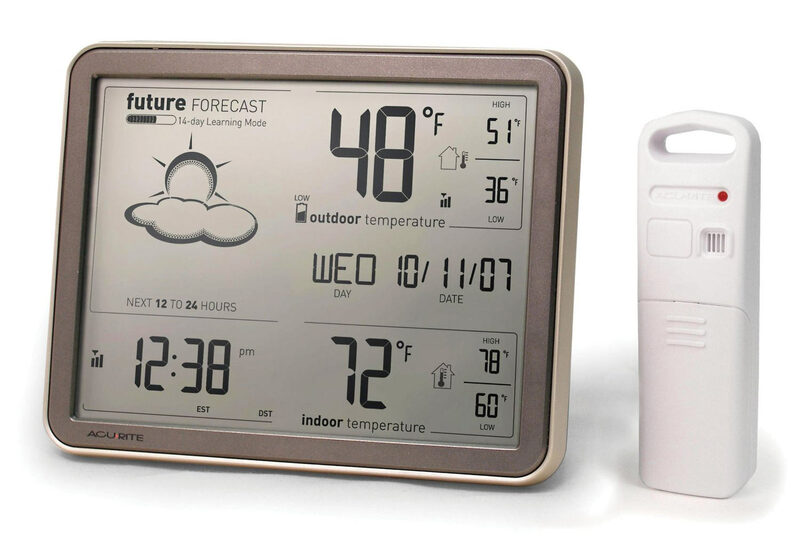 Thus the barometer was born and sent on its career throughout the civilized world. The most distinguished men of science have worked to develop from this crude, but original instrument of three hundred years ago, the fine instrument of the present day, but the modern instrument is nothing but the original “tube inverted in a cup of mercury,” with many refinements. Patterns and styles have been many, the most ingenious and common pattern being the one operated by a mercury tube set in the back of a banjo-shaped frame, to which is fitted a dial divided in inches, bearing the very familiar but grossly inaccurate legends “Stormy,” “Fair,” and “Fine Weather,” over which an indicating hand travels. In 1798 M. Compte, Professor of Aerostatics in the school at Meudon near Paris, invented a “watch-like, metallic, air- tight vacuum case, the lid of which, sustained by internal springs, rises and falls under variable pressures.” This undoubtedly was the first “aneroid” (Greek compound “without fluid”) barometer and was made for the reason that in his balloon ascents he found the mercury barometer suffered greatly from violent oscillation. Vidi subsequently made a case of different form. He constructed a box with corrugations at the top and bottom to make it more elastic in its movements. When the air was withdrawn from this box it naturally collapsed at its centre. By a mechanical contrivance the two surfaces were made to open again by fitting studs to the upper and lower centre of each surface, pulling them apart, and mechanically holding them open. Any increase in the pressure of the air, of course, weighed down on this “box” or “chamber” and closed it slightly: any decrease in pressure had the opposite effect, and allowed it to open. This movement was transmitted to a series of levers terminating at a small post or pin to which an indicating hand was fitted. 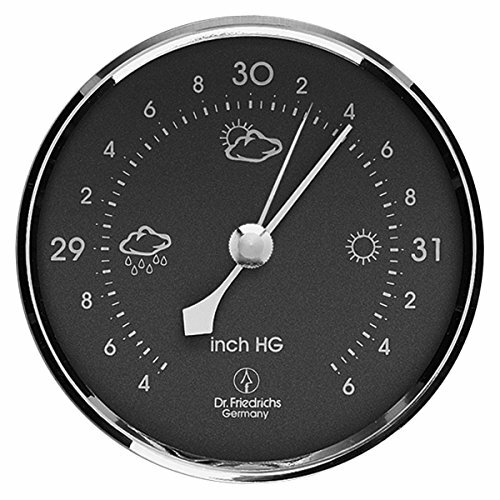 A suitably engraved or figured dial enabled all changes in pressure to be fairly accurately and quickly read. This, when completed, made a very portable instrument and at once sprung into popularity. 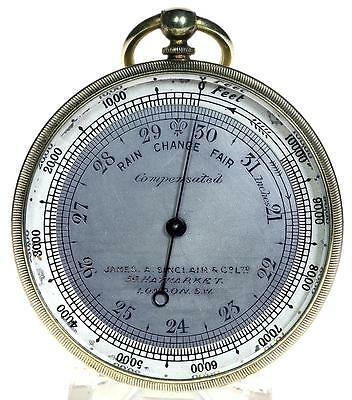 It seems to have been further developed by English makers, and the result is that today there are made aneroid barometers constructed in such a manner as to show changes of as little as 1-1000th of an inch pressure. The invention of the aneroid type of instrument was of great importance since it would be out of the question to carry for any distance a large mercury barometer, at least 34 inches long, both cumbersome and non portable. Made, as they are, in sizes varying from about two inches for the tourist or traveler up to five inches for the surveyor, they are not only very portable, but extremely accurate, providing they are not abused and are handled with ordinary care.